Marion County Courthouse, Jefferson Texas. The city of Jefferson was founded in the early 1840s and was originally the county seat of Cass County when that county was organized in 1846. 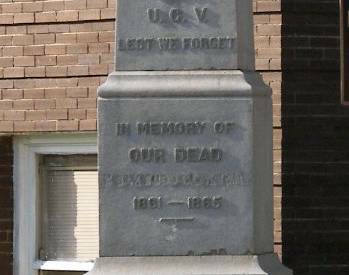 It lost its county seat status to Linden when that town was formed in 1852, but became the county seat of the newly formed Marion County in 1860. County leaders met in several different places before a vote was held in 1867 to construct a courthouse, including a plantation home, a building known as Birgess Hall and the Perry Building. None of these buildings survive today. 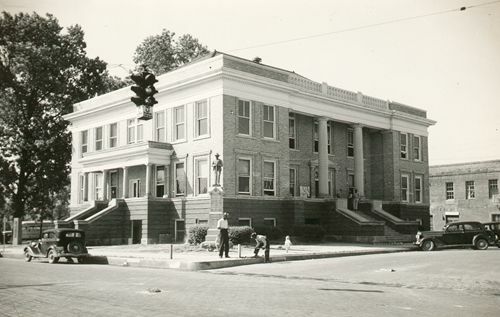 After six years of raising the money and a year of construction, the first courthouse was completed in 1874 near a plantation away from the downtown section of Jefferson. Designed by architect Thomas Hinkle, it was a rectangular, two-story, brick, Greek Revival style building with a gabled roof, full entablature and a front fa�ade containing a portico with four massive, unfluted Doric columns and a pediment that had a diamond shaped window. The front had three bays and the side had nine bays of windows. Defective lumber in the building�s roof caused a leak over the judge�s bench and when the contractors refused to fix it, the county refused to pay them for their work. Complaining that the courthouse was too far away from town, the government abandoned this building in 1876. It was later used as a school for Black children until it burned in 1937 (although the Texas Historical Commission lists the date as 1942.) 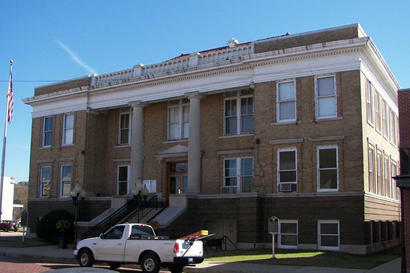 A building was rented for county business until the current courthouse was constructed between 1912 and 1913. 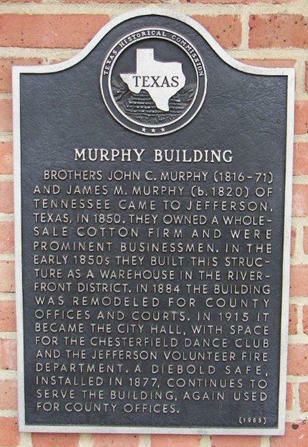 The Murphy Building, originally built in the early 1850s as a warehouse, was remodeled in 1884 for county offices and courts and is still used today as a courthouse annex. 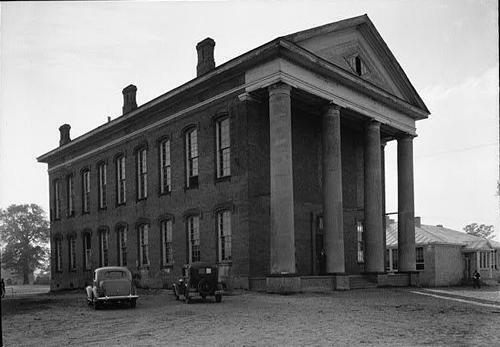 The current brick courthouse was designed by architect Elmer George Withers in a Classical Revival style with receding porticoes on the front and rear sides and two, two-story unfluted Doric columns framing the entrances. The building has a raised basement, an entablature and cornice surrounding the roof, balustrades over the front and rear entrances and a hipped roof covered with red tile. 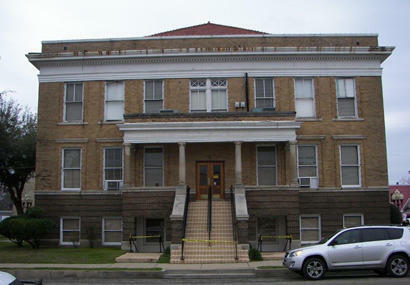 The courthouse is a virtual twin to the courthouse Withers designed for Roberts County in 1913 with the exception of an east side entrance with a small portico on the Marion County courthouse. 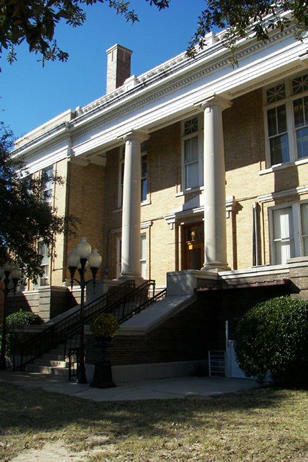 In 2010 and 2012, Marion County received grants from the Texas Historic Courthouse Preservation Program for emergency repairs to their courthouse, but hopes remain for an eventual full historic restoration. Sources: Longview News-Journal article by Randy Ross interviewing Sammy DeSpain of the Marion County Historical Commission, June 30, 2008, The Handbook of Texas Online, the Texas Historical Commission�s County Atlas at http://atlas.thc.state.tx.us/shell-county.htm, and The People�s Architecture: Texas Courthouses, Jails, and Municipal Buildings by Willard B. Robinson, 1983. Close up of rear portico. 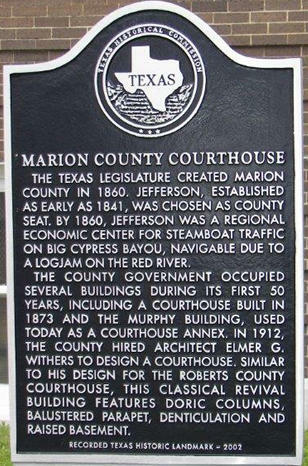 The Texas legislature created Marion County in 1860. Jefferson, established as early as 1841, was chosen as county seat. By 1860, Jefferson was a regional economic center for steamboat traffic on Big Cypress Bayou, navigable due to a logjam on the Red River. 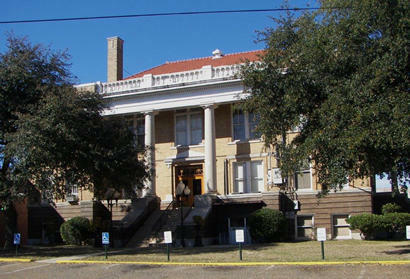 The county government occupied several buildings during its first 50 years, including a courthouse built in 1873 and the Murphy Building, used today as a courthouse annex. 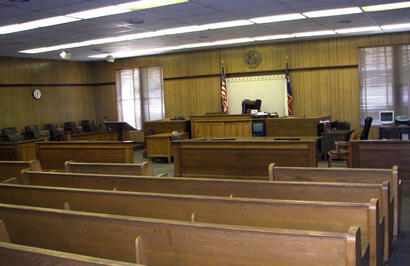 In 1912, the county hired architect Elmer G. Withers to design a courthouse. 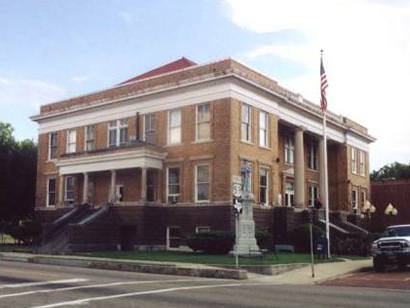 Similar to his design for the Roberts County courthouse, this Classical Revival building features Doric columns, blustered parapet, denticulation and raised basement. 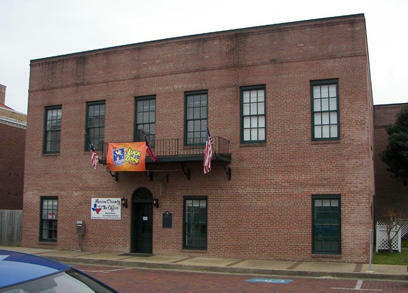 The Murphy Building, two buildings west of the 1912 courthouse, has been used for county offices and courts since 1884. Brothers John C. Murphy (1816-71) and James M. Murphy (b. 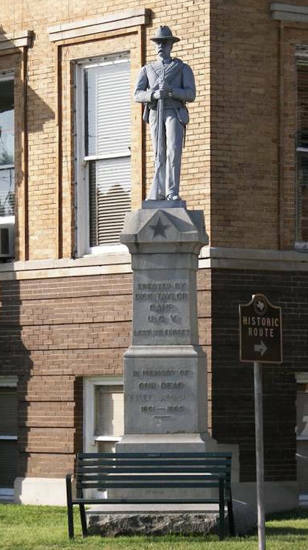 1820) of Tennessee came to Jefferson, Texas in 1850. They owned a wholesale cotton firm and were prominent businessmen. In the early 1850s they built this structure as a warehouse in the riverfront district. 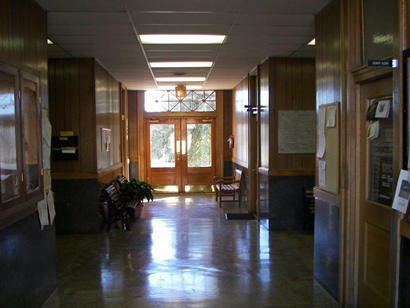 In 1884 the building was remodeled for county offices and courts. 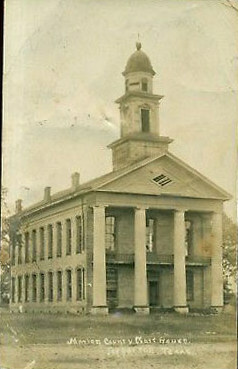 In 1915 it became the City Hall, with space for the Chesterfield Dance Club and the Jefferson volunteer fire department. A Diebold safe, installed in 1877, continues to serve the building, again used for county offices.